Vermont Custom Gage LLC. a subsidiary of Vermont Precision Tools Inc., Swanton VT, selected Lucifer Furnaces to create manufacturing capability with the addition of an air recirculating oven, a salt bath pot furnace and a quench tank. The new equipment will be used in the production of small steel component parts of their measuring (gage) equipment. 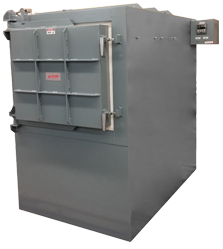 The oven, a 4000 series, model 48-R36 with working dimensions of 24”Hx24”Wx36”L, heats to 800°F and will be used for Tempering. 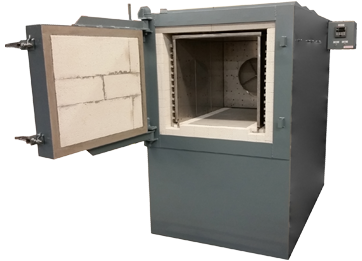 Insulated with 6.5” multi-layered lightweight firebrick and block insulation with a roof lined with ceramic fiber modules, the oven features a stainless steel liner which isolates the workload from the heating elements and directs airflow in a horizontal pattern. A high CFM fan assembly mounted through the oven rear wall circulates air over heating elements and back through the work chamber. The horizontal swing door is mounted with heavy duty hinges, 6” of insulation and two cam latches for a secure seal. After pre-heating, parts will be loaded into the salt pot furnace, model 2055-1624 and then oil quenched in a Lucifer Quench Tank, QT-2020, complete with air mixer, heater and soak timer. Next, the tools will be loaded into the 4000 series, model 48-R36 oven to be held at a constant temperature over a period of time to stabilize the structure of the steel. Vermont Precision Tools dba Vermont Gage manufactures a wide range of fixed limit gages including both threaded and cylindrical. Vermont Gage manufactures high quality gages with tolerances ranging from .00020” – .00002”. Vermont Precision Tools Inc. chose Lucifer Furnaces for the equipment based on its robustness and value.